The central government agencies like the NIC, NeGD, CDAC, under the broader umbrella or Ministry of Electronics and Information Technology (MeitY) are advancing the agenda of e-Governance by evangelizing the use of IT and Digital and building blue prints, applications and solutions for the government departments. As a part of our continuous interaction with various thought leaders in the government, we are discovering many novel applications. In this post we bring to you the concept of eHospital@NIC and present the excerpt of a discussion between our analyst Ankur Aggarwal and Mr. Ajay Rampal of National Informatics Center (NIC). Ankur: Honorable Prime Minister mentioned eHospital in one of his speeches. Would you please throw some light on it? Mr. Rampal: eHospital@NIC (http://ehospital.gov.in) is a cloud based hospital management information system (HMIS). An HMIS is a hospital ERP application. National Informatics Center (NIC) has developed eHospital@NIC for the government hospitals. All the government hospitals can benefit from this application. It is intended to streamline a hospital’s administrative, clinical and financial operations. 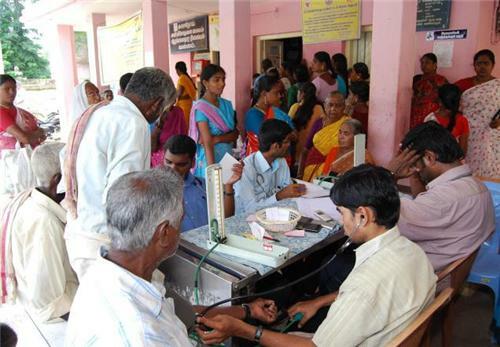 The government hospitals can provide better services to their patients. Thus eHospital@NIC improves the efficiency and effectiveness of healthcare services that a government hospital provides to the citizens. Many States like Tripura, Karnataka, Chattisgarh have decided to implement eHospital@NIC in all their district hospitals. Ankur: How can the citizens and the hospitals benefit from it? ORS is just one of sixteen modules that eHospital@NIC offers. Other modules include Patient Registration, OPD Management, IPD Management, Lab Information System, Blood Bank Management, Dietary Services, Laundry Services to name a few. These cover all the functional areas of a hospital that can be integrated with the use of e-Hospital. It can have a single source of truth in the form of a centralized database. eHospital@NIC being a cloud application obviates the need to maintain a local server at the hospital’s end. It is hosted at the national data center. The application is integrated with Aadhaar, payment gateways, SMS/EMail gateways, thus saving each hospital of integration with these services. The government hospitals that haven’t yet installed servers benefit hugely on time and cost. They need not spend time and money on installing servers and buying HMIS software. Ankur: What is the implementation model of the system? Do the hospitals prefer a phased adoption or a big bang approach to adopt all the modules in one go? Mr. Rampal: So far, we have got a mixed reaction from the government hospitals. eHospital@NIC , being a cloud application, obviates the need of setting up local servers, buying HMIS software and setting up Local Area Networking. What all it requires is medical devices, printing devices, access devices, and broadband connectivity. The access devices may include computers, laptops, tabs etc. that can be used to access data on the eHospital@NIC server and input further data. As a smooth and fast implementation plan, it is advisable for a hospital to on-board the platform with as many modules to begin with as much required devices are available with them. With this approach it may want to launch even the non-clinical modules such as laundry module and the dietary module in one go. On the other han, if the hospital is not well equipped, it would have to get in the process of procurement which is a time consuming process. it would include need assessment, floating of tenders, finalize tenders, procuring systems and getting them installed. All these may take it somewhere between 1 year to 3 years depending on the gap in availability and requirement. In that case if the hospital adopts the gradual approach of onboarding on the eHospital@NIC platform it can immediately benefit from the implemented modules. To start with a hospital may adopt the ORS module which will also benefit the patients (citizens) in a big way. Any hospital can onboard on ORS within 30 minutes. Since eHospital@NIC is a cloud application, it comes with the inherent benefit of scalability and flexibility. A hospital can plan to implement the rest of the modules in a phased manner. However, the more the modules, well integrated with each other, the better will be the capacity of the IT system to support the hospital’s management. Ankur: Thanks you Mr. Rampal for providing valuable insights. Mr. Rampal: You are most welcome. I must say Maximum Governance is doing a great job of bringing such initiatives in open. I wish you all the very best.